Delicious & Nutritious Salad: Perfect for a BBQ! With Memorial Day weekend right around the corner, I wanted to give you all a PERFECT salad recipe that is absolutely delicious for a backyard BBQ. Black bean salad loaded with colorful veggies. Super easy. It can be easily doubled, tripled, etc. It’s so flavorful, packed with veggies and protein – it really could be a meal in itself! This recipe is a real crowd pleaser. My mom and I have made this for countless occasions with many different mouths trying it. It’s always been a hit. It’s great for warm weather parties because there’s no mayo in it. This salad travels well and keeps for days. It can be eaten room temperature or right out of the fridge! It’s also good in the morning with some scrambled eggs. I hope you enjoy it! If you bring it to your Memorial Day picnic, I promise you will not be disappointed! In a large bowl, whisk together lime juice, olive oil, chili powder, cumin and 2 teaspoons salt and 3/4 teaspoon black pepper. 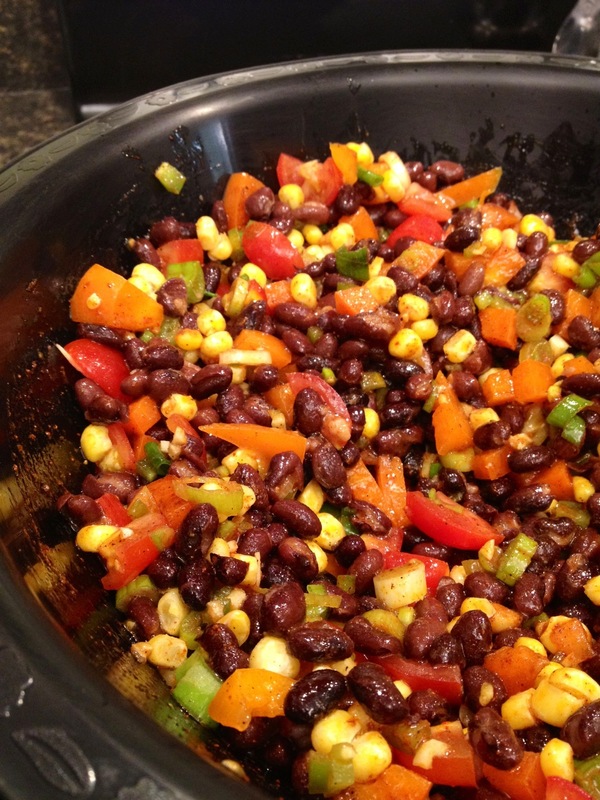 Pour in your beans, peppers, tomatoes, corn, jalapenos (if using) and scallions. Mix well. Season with salt and pepper to taste. Sprinkle with cilantro, if desired. Serve! So a few weeks ago, a couple of my girlfriends and I got together for a Mexican night. Mexican is definitely my favorite kind of food, hands down. I love the flavor combinations in the cooking. Live in Philly? Go to Las Bugambilias on 2nd and South. THE best Mexican food you can get. Don’t live in Philly? 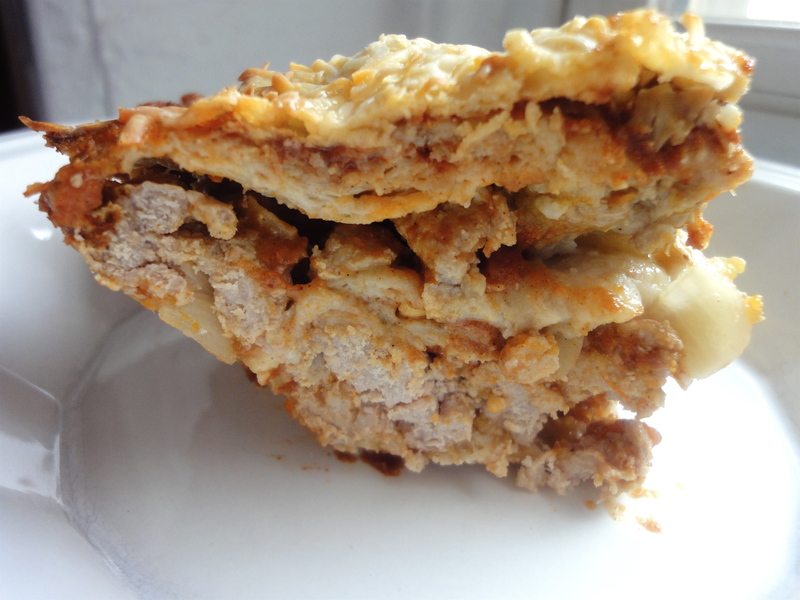 Give my enchilada lasagna a try! Enchiladas are great. But who feels like rolling up each individual one? Not me. 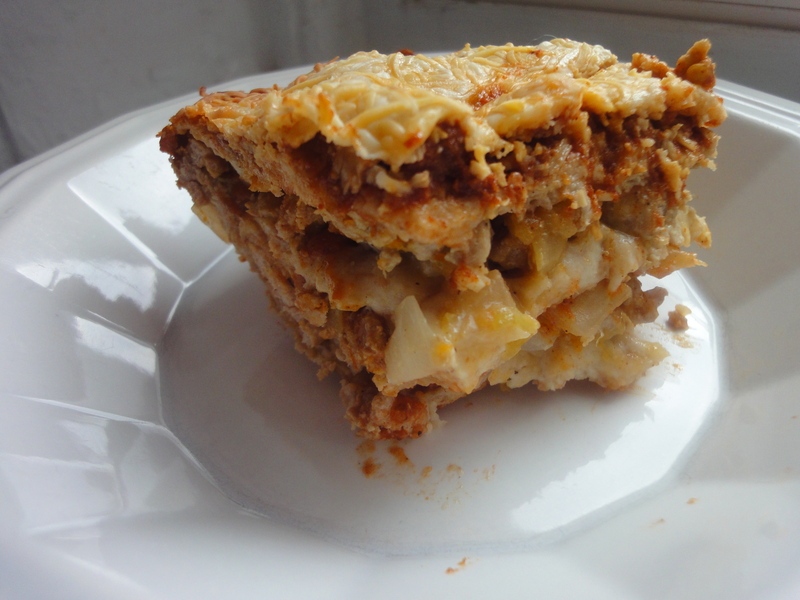 Putting the enchilada fixings into a lasagna makes it fast, easy and equally delicious. And no, don’t go buying enchilada sauce. Once you make this recipe, you will never need to again. I’m not vouching for its authenticity. I’m going for the easy factor. As always. Are you a beef lover? Feel free to swap the ground turkey out for ground beef. Watching calories? Swap out the cheese for reduced fat (that’s what I did). Don’t like whole wheat tortillas? Use flour instead. Get the point? Good. In a saucepan over medium heat, put in 1 tablespoon of olive oil. When warmed, add the flour and stir until combined into a paste. Add in the tomato paste and combine. Then, add the chicken stock in slowly, whisking constantly to combine and to avoid lumps. You don’t want the sauce super thick. Think a slightly thin tomato sauce. Season with salt and pepper to taste. Set aside. In a large pan over medium/medium high heat, add the ground turkey, garlic and onions. Cook until onions are slightly translucent and the turkey is cooked through. Add in a generous sprinkle of salt and pepper. Drain any excess fat. When the turkey is cooked, add in the green chiles and ½ of the cheese. Continue cooking until the cheese is melted. In an 8 x 8” dish, or a 9” cake pan, or something similar in size, put a spoonful of the sauce and spread out. (Note: Keep in mind to reserve another spoonful of sauce for the top!). Then layer in tortillas, breaking apart if necessary to create an even layer. Put score marks in the turkey mixture so you divide it into 3 even sections. Spoon 1/3 of the mixture onto the tortilla. Top with about 1/3 of the sauce. Repeat layering tortillas, meat, and sauce until you have 3 layers. Top with another layer of tortilla, then your reserved sauce. Sprinkle with your remaining cheese. Bake for about 15-20 minutes or until the cheese is browned and bubbling. Allow to cool for about 10 minutes before serving. Slice into pieces and enjoy!